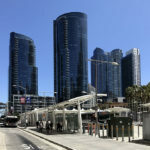 With new proposals having been submitted to the City for roughly the same number of residential units that finished construction in the second quarter of the year, the overall pipeline of apartments and condos under development in San Francisco is holding around 63,500 having peaked at 63,700 in the third quarter of 2016. As we first noted last year, the year-over-year growth in the pipeline has been trending down since the fourth quarter of 2015. And the year-over-year gain of 204 units in the second quarter of 2017 is compared to a year-over-year gain of 8,725 units in the second quarter of 2016. 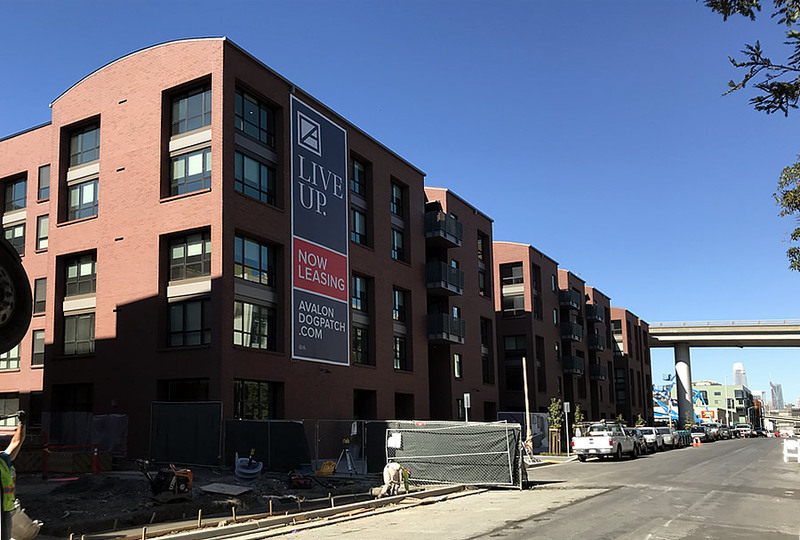 That being said, there are roughly 7,000 units of housing under construction across the city which should be ready for occupancy within the next year or two (including the remainder of Avalon’s 326-unit Dogpatch development at 800 Indiana Street, as pictured above), which is an increase of 26 percent from the 5,600 units under construction in the first quarter of the year. 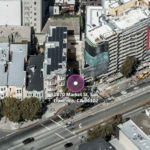 In addition, there are now 11,150 net-new units of housing for which building permits have either been issued, approved or requested, and 31,500 units in projects that have already been approved but not yet permitted (which includes the majority of the 10,500 units by Candlestick, 7,800 units on Treasure Island and 5,680 units at Parkmerced, projects which have overall timelines measured in decades, not years). And with proposals for another 13,800 units of housing under review by the City’s Planning Department, which is up from 13,300 the quarter before but versus 17,800 under review in the second quarter of 2016, San Francisco’s Housing Pipeline totals 63,500, including 10,600 “affordable” units which are to be offered at below market rates, according to our accounting of Planning’s database. At the same time, the pace of new construction condo sales in San Francisco appears to be slowing down, at least one index suggests that new condo pricing continues to drop, and rents in the city are down as well. We’ll keep you posted and plugged-in. I’d be curious how the new streamlined permitting will be affecting the pipeline in the near future. So the entire city of San Francisco gained 204 units last quarter? No. After subtracting the number of units which finished construction and were added to San Francisco’s housing stock over the past year, while adding all those which were newly proposed, the overall pipeline increased by 204. And here again is the problem with the boom-flat hypothesis. Buyers are hugely affected by the future path of housing prices. Most buyers are well aware of this fact and while their perceptions may not always be rational, they tend to act on their perceptions of future price changes. Sellers are mostly affected by the absolute price level and not the future path of prices. When prices flatten out at a high level the attraction to buyers drops radically, even if this realization takes time to percolate through the buying public. But builders and sellers have a huge incentive to get out while the getting is good. It’s well known that individual sellers may initially forgo selling if they are unable to realize some reserve price they have in their head. But builders and investors different incentives are are more motivated to act quickly and rationally. The Mark Co. notes that price per square foot for new units and existing units is converging and quite close. That may back up your view of incentives, if developers are basically trying to get out safely while existing owners are still holding out for high prices (as they tend to be more knowledgable about past gains than current conditions). Will be curious to see where this goes. Since most new buildings are still apartments rather than condos, I don’t really see any signs of the floor dropping out. Things seem pretty steady. And even beyond difference in speed of detecting changes in market conditions and decision making, a key issue for owner occupiers is that they need somewhere else to move to. Medium term, people do transfer jobs, retire early, down-size or even sell and rent based on economic factors. But all of the above takes time. Builders and investors can react much quicker. The current housing costs/ real estate prices in SF are not exactly a new phenomenon. Don’t you think sellers would have come around by now? The deceleration/flattening of prices is a recent phenomenon. The City has about 345,000 housing units. Half of San Francisco’s housing units were built before 1940. More than 75 years old. Even with crazy amount of $$$ people will spend here on renovations, those old units will not last forever, and especially past the next big earthquake. So even with 7,000 units of housing under construction in the past 2 years – we are not really replacing our capital – the housing stock – faster than we are using it over the longer term…..
I’m surprised by the statement that construction of units is holding. What I hear on the street is that very few (or even no) new projects are breaking ground. what I *see* on the street (at least on the streets of Dogpatch, Potrero Hill, Mission Bay, where I predominantly walk) are projects getting underway. Yeah, but in Soma, ie. 6th street, nothing is moving on 3-4 entitled projects. 119 7th is under construction. The four along 6th Street from Folsom to Harrison haven’t broken ground, true, but two have pulled permits. Elsewhere in SoMa 1532 Harrison has broken ground, plus the Goodwill site and 1699 Market in the Hub. Agreed. I’m actually surprised to still see projects breaking ground, but they still are. Vote of confidence in the market by quite a few developers. I’m also in Dogpatch/Potrero Hill and I think what we are really seeing is the impact of so many jobs in Mission Bay. It has really cemented Dogpatch as a desirable location. Hope that those developers’ pro forma hold up. I think we’ve seen quite a few fully permitted projects being offered for sale over the past year. The most plausible explanation are rising labor costs in the construction sector. I believe this is also a reason why construction has been stalling on a few developments in-progress such as Schlage Lock. Further, the recent wildfires have increased labor demand around Santa Rosa and they are sucking workers away from the city. Yep, and housing costs up there have increased. Under these circumstances, I don’t expect much growth in the pipeline. Here is what I don’t understand: Some large projects like Candlestick Park have enough open space to create temporary housing for workers on site. This could be offered at very low costs to construction workers and it would eliminate long commutes. SF construction salaries must be very strong compared to other parts of the US, so cheap on-site housing and longer working hours (due to no commute) would leave a lot of cash in the pockets of the workers at the end of the month. Now, I must admit I have absolutely no experience in this field and there must be a billion regulations preventing it from happening. However, looking from the sideline, it seems like it coule be a win-win for all parties involved. I don’t think onsite temp housing will solve the general problem. It would work OK for single workers. Workers with families however will want to sleep in their own bed at night, even though it may require a long commute. That is certainly true. But given <0% unemployment in the Bay Area, I'm sure these workers can find plenty of work already. This might be attractive for workers from other states or rural California that would be willing to work and live for a couple of months on site and then go home with a decent chunk of savings. I look at those 63,000 units and wonder if the planning department is still letting every developer build one parking space per unit. Even at .5 spaces per unit the traffic consequences are horrifying. The Planning department still hasn’t transitioned from suburban to urban. The pictured development has .7 spaces per unit and many of the other large ones have been in the 0.5-1.0 range. You’re right that this is a slow-motion disaster. Should be zero or, at most, zero net of existing parking.